The Rhododendron is a popular landscape plant. It is grown for its attractive dark green foliage and its large and impressive flowers that come in a variety of colors. Rhododendrons are susceptible to a number of diseases, among them certain blights that can affect the buds, branches and leaves of the plant. If left unchecked, these diseases can cause significant damage to the plant. 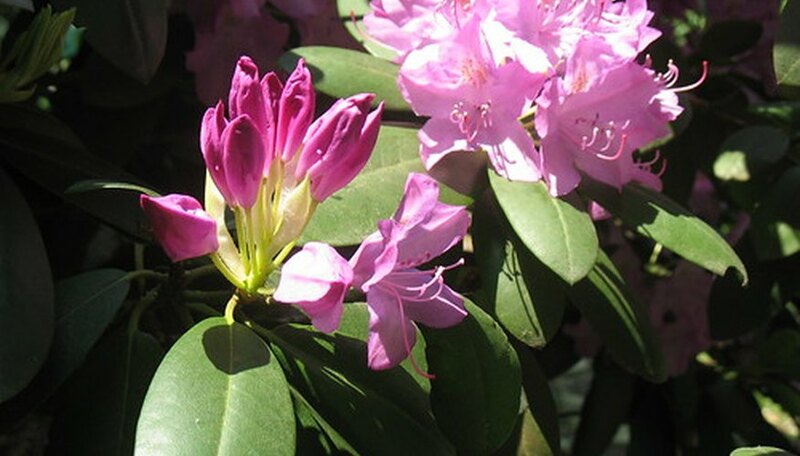 There are three distinct types of blights that affect rhododendrons, each attacking a different part of the plant. They are the petal blight, the bud and twig blight and the Ramorum leaf blight. The pathology and effects of each of these diseases are unique, as each of the blights is caused by a different pathogen. Petal blight results from infection by a fungus called Ovulinia azaleae and directly attacks the flowers of the plant. Bud and twig blight can be caused by either of two fungi: Botryosphaeria dothidiae or Seifertia azalea. Occasionally, species of the fungus Phomopsis sp. can cause a type of twig blight. Phytophthora ramorum, a fungus-like organism, causes Ramorum leaf blight. Hot, wet weather, especially during the flowering period, can trigger an outbreak of any of these diseases. In petal blight, the flowers are directly effected. The disease presents with tiny white to rust-colored spots on the petals of the flower, which enlarge quickly. This results in the eventual breakdown and rotting of the blossoms. Bud and twig blight is typically found on the branches and newly formed flower buds. The stems will wilt, and the leaves on the affected stems will die. In Botryosphaeria dothidiae infections, the older branches are usually affected. Within one to two days, the branch will wilt and the leaves will roll downward and stay attached to the stem. The tissue under the bark will turn reddish-brown, extending along the length of the stem. In Seifertia azaleae infections, the buds turn brown and do not open. They can eventually have black fruiting bodies from the fungus sprouting from the infected buds. Phytophthora ramorum infections produce a leaf blight that appears as necrotic spots on the leaves of the plant. Young plants are very susceptible. The leaves will eventually fail and die without rolling, and will fall from the branch. The stems may also die back. Proper prevention practices can help to reduce the risk of infection from these diseases. Purchasing plants that are certified free of disease, isolation of new plants for a quarantine period and good hygiene practices within the growing environment (such as sterilizing pruning tools between the pruning of each plant) will help. Containers and other objects that have come in contact with infected plants should also be treated. Reducing irrigation during periods of wet weather will help control the environment that these diseases thrive in. It is also important to remove and burn any infected plant trimmings to reduce the risk of spread. Early detection is important in preventing the spread of these diseases. The diseased portion of infected plants should be pruned away and destroyed. Treatment with fungicides, such as Fenstop, Insignia, Mancozeb, Stature and Segway can help to reduce infection and prevent it from occurring. It is important to remember that the treatment must completely cover the plant.